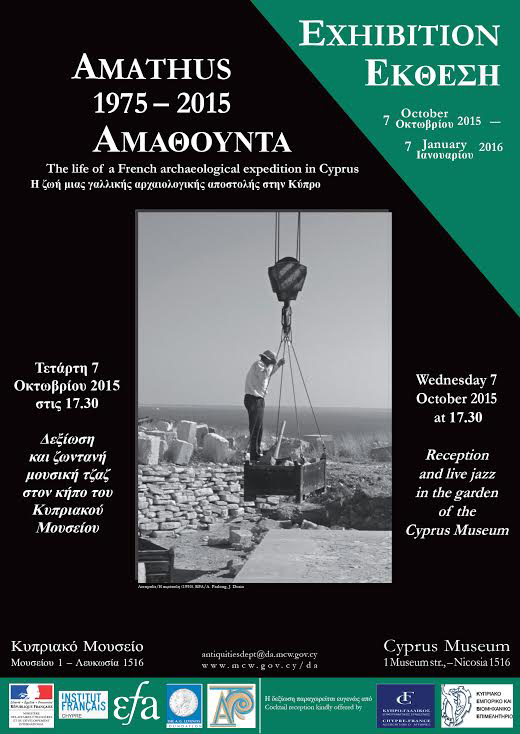 Opening of the exhibition “Amathus 1975-2015” in the garden of the Cyprus Museum. The periodical exhibition “Amathus 1975-2015: The life of a French archaeological expedition in Cyprus” is being presented in the garden of the Cyprus Museum to mark the 40th anniversary of the beginning of excavation at Amathus. The exhibition was organized by the French School in Athens and was initially presented at the School on the occasion of an international conference on the city-kingdoms of Cyprus. The aim of the photographic exhibition is to inform the public not only about the activities of the archaeological mission but also about the discoveries and the history of one of the most important kingdoms of Cyprus. Opening: 7 October 2015, at 5:30 p.m.